The small town of Fort Macleod has landed on Tesla's map. The electric car maker has set up one of its charging stations in the southern Alberta community. The small town of Fort Macleod has landed on Tesla's map. The electric car maker has set up one of its charging stations in the southern Alberta community. 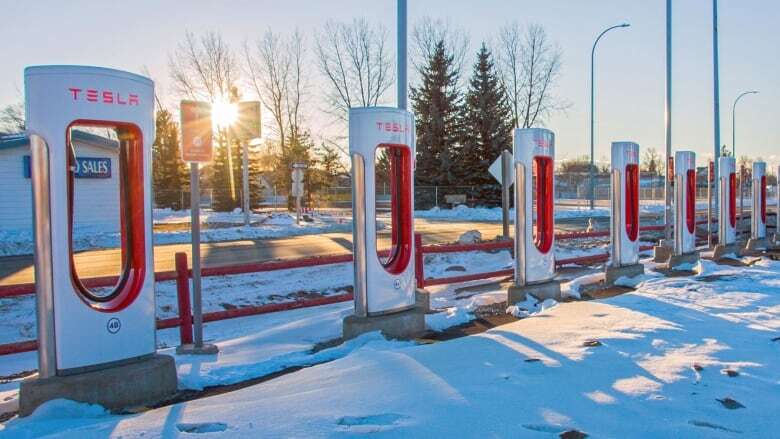 Officials convinced Tesla the town would be a good location because it's at the junction of Highway 2 and Highway 3, said Sue Keenan, the town's chief administrative officer. "Tesla thought it was a great idea so we had some ongoing conversations with them that started in about March of 2016. They came out and checked out the town and found an ideal site and decided to pursue it as an opportunity." Keenan says Tesla leased space from a local business owner and the eight-unit charging station is a short walk from most of the businesses on the main drag. It takes about a half an hour for drivers to re-charge their batteries. Keenan says that's just enough time for them to look around the local shops or grab a meal. "The economic development impact is phenomenal," she said.